“Flekkie” won his first Springbok cap against Italy in Port Elizabeth on June 12, 1999, scoring a try in South Africa's 74-3 win. The aggressive and passionate outside centre showed his worth in the 1999 World Cup and was elevated to the Springbok vice-captaincy in 2001. He won a total of 31 Test caps and scored 10 tries. The free-spirited Fleck relished physical confrontation and few opponents got the better of him. 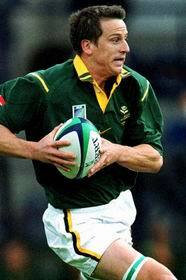 Fleck’s standout performance in the Green and Gold was against the All Blacks in the classic Tri-Nations Test at Ellis Park on August 19, 2000. After being dropped by then Springbok coach Nick Mallett, Fleck was recalled for the injured De Wet Barry and scored two sensational tries to help South Africa to a memorable 46-40 victory. Unfortunately, he missed most of the 2002 international season through injury and made his last performance for the Springboks in the infamous 53-3 defeat to England at Twickenham. Fleck came to prominence in the 1998 Currie Cup season in which Western Province made it all the way to the final. He played for the Emerging Boks that same year and ultimately won 48 Super Rugby caps for the Stormers, scoring 16 tries. In 2003, he signed for Bath but spent a considerable amount of time on the sidelines throughout his two years at the English club through injury. He has remained involved in rugby and is currently the backline coach of Western Province and the Stormers.